My name is Benjamin Blech and I come from a long line of rabbis – in fact, I am the tenth in line to have rabbinic ordination in my family. My father was a chasidic rabbi – a follower of the Chortkover Rebbe – with a congregation first in Zurich, Switzerland (where I was born) and later in Boro Park. He was also the Rosh Yeshiva of Mesivta Toras Emes (where I was educated). So my father was also my first and most influential teacher. After Torah Emes, I attended the Yeshiva Torah Vodaas and the Lakewood Yeshiva. I received my rabbinic ordination from Yeshiva University, as well as a Master’s Degree in psychology from Columbia University. Subsequently, I became a pulpit rabbi – of Young Israel of Oceanside – and also a teacher at Yeshiva University. I explain my background here because it has a great deal to do with how I came to the attention of the Lubavitcher Rebbe and why, I believe, he selected me for a special mission in the Far East. The first time I met him was in the 1960s, when I became president of the National Council of Young Israel Rabbis. The Rebbe had called Young Israel and requested that the president of the National Council come to meet him – in order to discuss the issue of Soviet Jewry. Although it was a long time ago, I still remember the awe I felt in coming face-to-face with this Torah giant. I have met many famous and important people, but there was no comparison with any of them and the Rebbe, in terms of the aura of holiness around him. 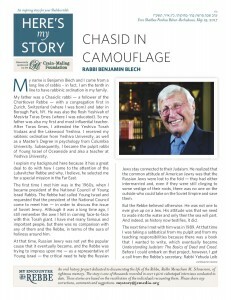 At that time, Russian Jewry was not yet the popular cause that it eventually became, and the Rebbe was trying to impress upon me – as a representative of Young Israel – the critical need to help the Russian Jews stay connected to their Judaism. He realized that the common attitude of American Jewry was that the Russian Jews were lost to the fold – they had either intermarried and, even if they were still clinging to some vestige of their roots, there was no one on the outside who could take on the Soviet Empire and save them. But the Rebbe believed otherwise. He was not one to ever give up on a Jew. His attitude was that we need to wade into the water and only then the sea will part. And indeed, as history now testifies, it did. So I came to see the Rebbe, and he explained that he wanted to send me to various communities in the Far East, where he had already established beachheads. The Jews in these places were wary of his chasidim because they were not used to seeing chasidic garb which looked other-worldly to them; thus they were keeping their distance. But someone like me, who looked “normal” and who spoke well in English, using the modern idiom, could get the message across, ease the way for the emissaries, and bring everyone together. How could I say no? Of course, I went. The chasidim arranged everything – all I had to do was speak. I spoke in Australia and in New Zealand; I spoke in Singapore and Tokyo; I spoke in Bangkok and Hong Kong. Wherever I went, I was very well received, and my mission was highly successful. I thought that was a fantastic line. And it really encapsulated the attitude of Chabad Lubavitch – not to judge any Jew by the externals but to recognize the inner essence of every Jew for what it is: the power to make the world a better place. Rabbi Benjamin Blech is associate professor of Talmud at Yeshiva University and author of many books including, among others, Understanding Judaism, If God is Good, Why is the World So Bad, and the Idiot’s Guide to Jewish History and Culture. He was interviewed in January of 2012.